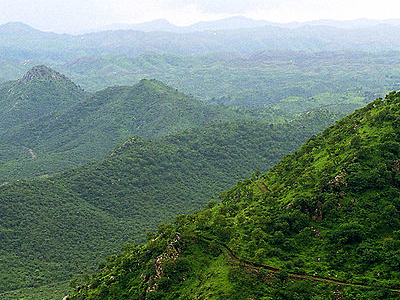 The Aravalli Range (Aravali) literally meaning 'line of peaks', is a range of mountains in western India and eastern Pakistan running approximately 800 km from northwest to southwest across Indian states of Rajasthan, Haryana, and Gujarat and Pakistani provinces of Punjab and Sindh. It is also called Mewat hills locally. The northern end of the range continues as isolated hills and rocky ridges into Haryana state, ending in Delhi. The famous Delhi Ridge is the last leg of the Aravalli Range, which traverses through South Delhi and terminates into Central Delhi where raisina hill is its last extension . It is one of the World's oldest maountain ranges. It dates back to pre-Indian subcontinental collision with the mainland Asiatic Plate. The southern end is at Palanpur near Ahmedabad, Gujarat. The highest peak is Guru Shikhar in Mount Abu. Rising to 5650 feet (1722 meters), it lies near the southwestern extremity of the range, close to the border with the Gujrat District. The city of Udaipur with its lakes lies on the south slope of the range in Rajasthan. Numerous rivers arises amidst the ranges including, Banas River, Luni River, Sakhi, Sabarmati River. 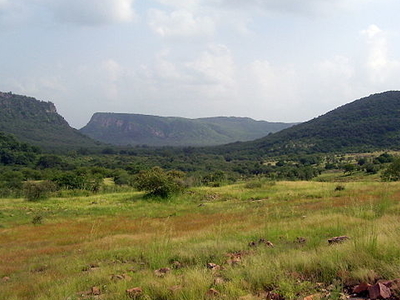 The Aravalli Range is the eroded stub of a range of ancient folded mountains. The range rose in a Precambrian event called the Aravalli-Delhi orogen. The range joins two of the ancient segments that make up the Indian craton, the Marwar segment to the northwest of the range, and the Bundelkhand segment to the southeast. Old fold mountains are characterized by having stopped growing higher due to the cessation of upward thrust caused by the stopping of movement of the tectonic plates in the Earth's crust below them. In ancient times they were extremely high but since have worn down almost completely by millions of years of weathering. In stark contrast Himalayas are continuously rising young fold mountains of today. Here's the our members favorite photos of "Mountain Ranges in India". 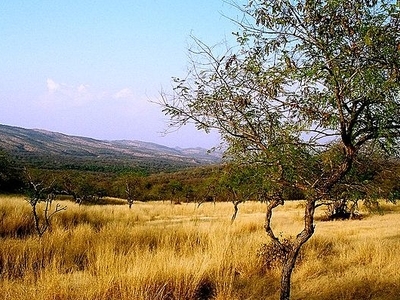 Upload your photo of Aravalli Mountains Range!